Trailhead is on Isaac Frye Highway, on the right off Rt. 101 going west, in Wilton, NH. To get there, take Isaac Frye Highway off Rt. 101, 0.3 miles west of Rt. 31. Drive 1.4 miles and turn left onto Sand Hill Road. Then immediately turn right to continue on Isaac Frye Highway. Drive another 0.3 miles and park in front of the gate on the near side of the bridge just before Putnam Hill Road. Recently, parking on the roadside has become restricted due to overuse. Garwin Falls is a unique and beautiful waterfall, quite possibly the finest in southern NH. Access is very easy. From the pull-off on the right side of the road, follow the snowmobile trail toward the unnamed brook. A spur path on the left leads to a small cascade. This scenic cascade is a worthy destination in itself. Further down, the trail passes by a large dam. In the summer, the area behind the dam is wide open, but in early spring, it may be completely flooded. As the trail continues downhill, follow another spur on the left to get to the falls. 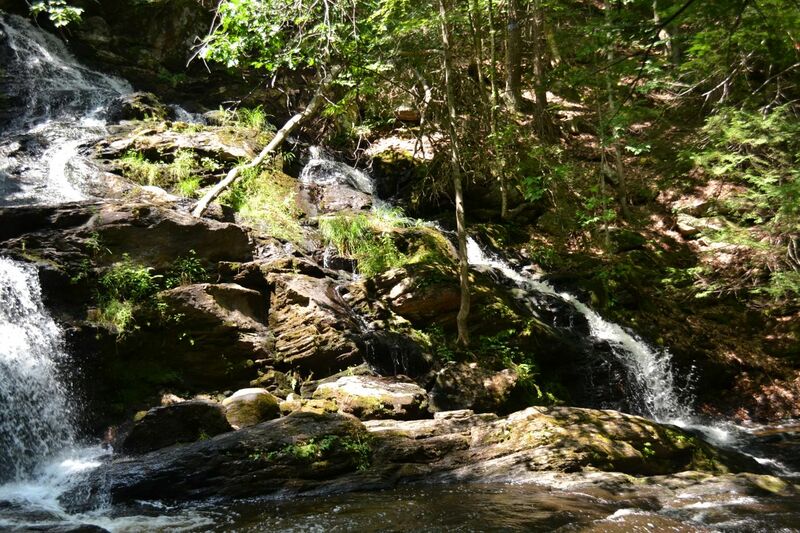 As Mill Brook drops over the rocks of Garwin Falls, it is forced into several different channels, creating a waterfall broken up into different sections. At the top, the water bounces off a rock and forms a large half-domed fan. Below is a wide plunge into a pool. On the side, water slides down a narrow path apart from the waterfall. Enjoy this picturesque beauty all at once!